Over two years ago I reviewed Bugaboo Cameleon 3 and now it’s time to check its new, upgraded version – Cameleon 3 Plus! 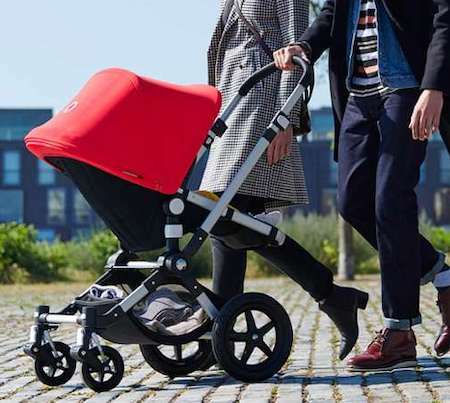 Dutch Stroller manufacturer, Bugaboo, recently unveiled the latest incarnation of its Bugaboo Cameleon 3, the Cameleon 3 Plus. This new edition now has several trends that add to the niftiness that the Cameleon has always been known for, and promises optimum convenience and ease of use while being much more comfortable to the rider. *Please note that the previous model – Cameleon 3 has been discontinued. What’s new with the Cameleon 3 Plus? Let’s see what are the upgrades and improvements for this new Bugaboo Cameleon 3+. If you aren’t new to Bugaboo strollers, then you must be familiar with the level of customizability that they allow on almost all the components from the canopy to the wheel caps. All the bases and bassinet fabrics of the now discontinued Cameleon 3 came in black. However, parents had the option of getting the canopy and bassinet apron in any of the following colors; red, black, orange, grey mélange, petrol blue, ice blue, soft pink, and off white. The Cameleon 3+ still allows you to get the sun canopy in a color of your choice. The good news, however, is that Bugaboo has scrapped off most of the basic colors in favor of a sophisticated color lineup that is commonly used for other high-end Bugaboo strollers including Bee, Fox, and Donkey. In addition to these 3 remaining colors; soft pink, black, and grey mélange, you can get the canopy in 8 other exciting hues; sky blue, sunrise yellow, blue mélange, waves, birds, neon red, fresh white, and ruby red. Besides the customizable canopy, you are no longer limited to the black base of the Cameleon 3. You now have 2 color options here. You can get it in an aluminum frame with black seat and bassinet fabrics, or black frame with grey mélange seat and bassinet fabrics. The most noticeable difference between the Cameleon 3 and the Cameleon 3 Plus is the design of the seat. While the seat of the Cameleon 3 was irresistibly elegant in terms of design, it was not the most comfortable especially for smaller tots due to its large size. In addition, its fixed v-shape design meant that even when reclined, the rider would still be in a seated position, and this greatly affected their comfort. With the new Cameleon 3 Plus, the seat frame has been updated to resemble those of the Fox and Donkey models. The foam on the seat has also been removed to give it a more streamlined design. Another significant change… an up to date basket! The underneath basket that had a solid black fabric construction is yet another area that needed some improvement with the Cameleon 3 and the 3 Plus has it. Parents complained that the previous basket’s shape and optional drawstring made it quite hard to access the stuff. The new stroller now has a redesigned basket made of mesh fabric and with open sides for easy accessibility. Below you can see video from Magic Beans where all the new features are presented. Other than those few, yet very impressive changes, the Bugaboo Cameleon 3 Plus is still the iconic stroller that it has been for over 15 years now! Usable from birth to toddlerhood (37.5 lbs)– as you’d expect for a pushchair at this price range, the Cameleon 3 Plus has been designed to be the only stroller that your bub will want throughout their stroller age. You can use the bassinet during the first few months before transitioning to the seat once the baby can sit unsupported. Even better, you can convert it into a travel system by adding any of the popular car seats. Reversible handlebar– a height-adjustable handlebar is a staple feature among most strollers, but a reversible one isn’t something that you come across every other day. The main idea behind a reversible handlebar is to make it easy for you to get through different terrains with relative ease. For instance, when reversed, the bigger rear wheels become the ‘front’ wheels and make it so easy to go over rough patches that might not be so easy for the smaller wheels. Mind you, the reversible handlebar also means that you can change the direction that your young rider is facing without you having to remove the entire seat and turning it. But keep in mind that this will only make sense on short trips and on smooth terrains since maneuvering the stroller with the big wheels at the front can be quite cumbersome. Having big wheels at the front may be useful for getting through sand on the beach or the snow. Easy to carry and store– this Bugaboo stroller is fairly lightest at 21 pounds, and it is light to lift and carry over short distances. When it comes to storage and transportation, the chassis with either the seat or bassinet can be separated into 2 items both of which are designed to fold down flat for compact storage. Picture of Bugaboo Cameleon 3 Plus belongs to Bugaboo. If you want to read more about this stroller and see what’s included in the basic set visit PishPosh Baby!